'S e dùthaich ann am Aimearaga Mheadhanach a tha ann an Hondùras (IPA: hɑnˈduːrəs). 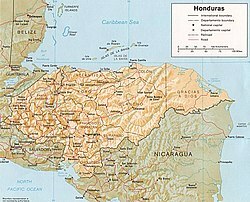 B' àbhaist ainm eile a bhith oirre: Hondùras Spàinnteach (Spanish Honduras sa Bheurla ). Mar sin dheth cha robh measgachadh ann le Hondùras Bhreatannaich (British Honduras sa Bheurla), a-nise Beilise. Tha crìochan aice le Guatamala san iar, le El Salbhador san iar-dheas agus le Niocaragua san ear-dheas. Tha an Cuan Sèimh san taobh a deas, agus an Gulf of Honduras, pàirt den Mhuir Charaibeach, san taobh tuath. Air a tharraing à "https://gd.wikipedia.org/w/index.php?title=Hondùras&oldid=500687"
Chaidh an duilleag seo a dheasachadh 22 dhen Iuchar 2015 aig 21:29 turas mu dheireadh.